In 2004, “Lost” put a new spin on an old technique by using flashbacks as the main element of storytelling. “Lost” had its days of glory and misery and ended its run with a strongly polarizing finale. One year later, “Lost” writers Adam Horowitz and Edward Kitsis continued their previous method of storytelling with a brand new show, “Once Upon a Time.” This time, they decided to add a new element to their show: magic. Eight years before its premiere, Kitsis and Horowitz pitched the premise of “Once Upon a Time” to networks, but they were refused because of the show’s fantasy nature that seemed to apply only to young audiences. However, ever since the pilot episode became the biggest debut on ABC since 2006, “Once Upon a Time,” now in its third season, has remained the highest rated scripted show on Sunday nights. “Once Upon a Time” is set in Storybrook, a small fictional town near Boston. At first glance, Storybrook seems to be a typical town with ordinary people. However, as the show progresses, we discover the residents of Storybrook have been cursed by an evil queen to come to this world, live as a person, and forget about their past identities as fairytale characters. Like “Lost,” each episode focuses on a character by revealing his/her life in the past and in the present. What makes “Once Upon a Time” so enjoyable is that all the fairytale characters are connected to each other in the most unexpected ways and they may not be the characters we recognize from popular fairytales. In “Once Upon a Time,” nothing is impossible: heroes can turn out to be villains and vice versa. White and Charming have a child named Emma. But in the moments before the Evil Queen casts a curse that causes all the people of the Enchanted Forest to transfer to a horrible world sans magic (ours), the couple manages to save Emma by sending her to our world apart from the other characters in hopes that she will one day break the curse. When White and Charming, known in our world as Mary Margaret and David, fall in love despite not remembering their real identities, we see the power of true love, which no curse can overpower. “Once Upon a Time” may be simply a TV show, but Prince Charming and Snow White’s true love was strong enough to fire up a love between co-stars Goodwin and Dallas. After they met on the set in 2011, they got engaged in October 2013. It seems that fairytales can become true after all. “Once Upon a Time” presents the fairytale characters we grew up dreaming about and entertains us as adults with its powerful storyline and strong performances. With nearly every episode finishing with a huge cliffhanger (not to mention the mother of all cliffhangers in the season one finale), waiting for a new episode can be a pain. With so many unexpected plot twists and bombshells, the show never fails to play with your emotions. If you believe in magic and true love, don’t miss this show. You can watch the last two seasons on Netflix or iTunes. 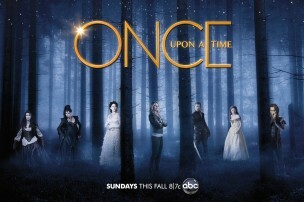 “Once Upon a Time” airs Sundays at 8 p.m. EST on ABC.